Mike’s Carwash Beavercreek location team members present a check to Big Brothers Big Sisters of Greater Miami Valley CEO Joe Radelet. 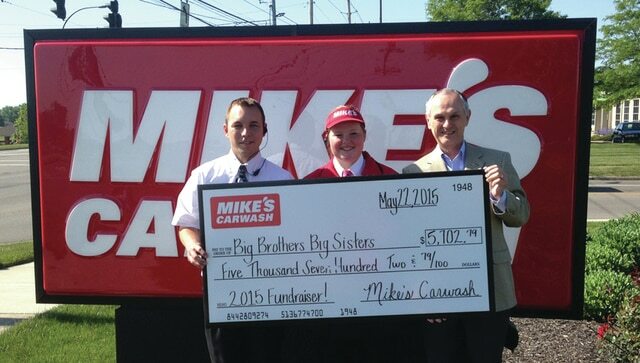 BEAVERCREEK — For the sixth year, Mike’s Carwash raised money and awareness for local Big Brothers Big Sisters’ youth mentoring programs. According to the carwash’s corporate offices, $5,702.79 was raised for Big Brothers Big Sisters of the Greater Miami Valley. Funds were raised by the company donating half of the costs of all Mike’s Ultimate and Works washes purchased on May 2. Customers also were able to make donations to the non-profit organization during the day. All funds raised will help offset the cost of programming for youth mentorship.